BTW, PLA ground force has a unique flag like PLAN flag, however I can hardly find it in most army events, I found only one clear image for may flag, I do not know maybe because it is too ugly LOL? 3 units commissioned wow just wow !! Good find ! with this 3 new now 6 x 072B/Yuting III all for ESF, ceremony in their homeport to Shanghai-Qiujiang 31°18'30.04"N 121°33'19.84"E we see the blue roof with a small tower on the corner. They have in more 9 x 072A. 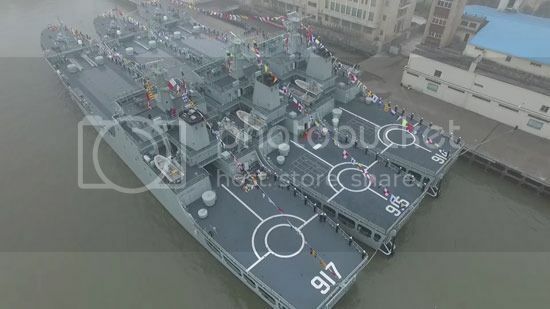 Now 16 of these larger Type 072A/B. bruceb1959, DigoSSA and FORBIN like this. Thats the dry section of the ship that loads/unloads through the bow opening, right? Are there any photos or info about the rear well section? Its dimensions? Is it connected to this front section with a ramp that vehicles can go over? Think that's a table tennis table ! That photo I think is taken from the bow, looking to the aft of the ship.